South Africa's president has provoked anger after saying he would beat his sister if she told him she had fallen in love with an opposition leader. Thabo Mbeki made the comment during an election rally when he was criticising African Christian Democratic Party leader Rev Kenneth Meshoe. NGOs and opposition parties seized on the gaffe saying he should apologise or at least clarify matters. The ruling African National Congress said the remark was made "in jest". "You'd have to be insane to think he was serious," ANC spokesperson Smuts Ngonyama said. The South African Press Association (Sapa) - which originally reported the speech at an ANC rally in Rustenburg - later issued a clarification. 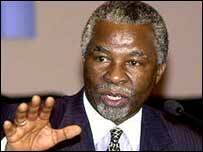 It said the remarks had been made in a light-hearted vein, and that Mbeki had been speaking in the vernacular. Representatives of women's rights groups have expressed concern over the comment. Director of Gender Links, Colleen Lowe Morna, said President Mbeki's remarks were unfortunate because whatever he said, whether in jest or not, carried weight. "His comments send a wrong message that men control the thinking, like they can just think of beating a woman and just do it." Rev Meshoe said he was "very disappointed" by President Mbeki's words. "If truly it was a joke it was a bad joke," he told the BBC's Focus on Africa programme. "If people made jokes about him and his private life he would be upset." The row comes just ahead of the country's general elections on 14 April. The ANC is predicted to win the election by a landslide.